For those following refusals and grades 3-8 ELA testing concerns, here is the 2014 SAANYS educator feedback report identifying a variety of complaints and concerns teachers and admins had regarding the Spring 2014’s grade 3-8 standardized ELA exams administered to students. The report is disturbing to read. Educators reported that students pulled out their eyelashes, wet their pants, yanked at their hair and got physically ill in response to these difficult, developmentally inappropriate, confusing exams. Special education students were particularly affected. While my own district did not submit a comment, other area schools did. The feedback from educators about the cc exams students took was overwhelmingly negative. Which begs the question, why on earth would any parent allow their child to take these tests and how on earth does an educator administer it without feeling conflicted about what they are subjecting students to? Does this not violate teachers code of ethics? • Ausable Valley SD, Keeseville Elementary – The results in my school (whether they turn out good or bad) cannot be considered valid or useful in any way. Not only will those results not include 1/3rd of the student body, but the 2/3rd that did take it most likely did not try their best once they saw 1/3rd of their classmates refused the test and in their minds “did not have to take it.” How can we expect kids to try their best when they know many kids did not take the test? I am also concerned that this refusal rate will increase significantly for math now that the students saw their “friends” refuse on the ELA. • Chappaqua SD, Westochard School – The test was difficult. It left some students crying, more students than last year did not finish some parts. The questions were very difficult to interpret, more difficult than the reading passages. • Delhi SD, Delaware Academy – Children were tired/frustrated after 3 days of testing. Teachers felt that parts of the test were very difficult. It may influence others’ decisions to “opt out” of the math assessment. • Hunter-Tannersville SD – By the third day several 3rd graders shut-down emotionally and were unable to finish the exam. Students are being given mixed messages – teachers tell students to do their best, parents tell students not to worry because the test doesn’t count for anything. Therefore, some students who did not opt out left portions of the test blank because they did not have an urgency to complete it. Special education students were distraught, and blamed teachers for making them take the test. Some students, although given double-time based on their IESs, were overwhelmed with the amount of material to read and write. • Saranac Lake SD, Saranac Middle School – What are the lexile levels of the passages and questions for each test? The secure materials are not cared for by UPS consistent with SED expectations – some of the boxes had holes due to shipping. Guidance with regard to issues such as opting-out/refusals is inadequate for those managing the logistics of student supervision while still trying to ensure an appropriate testing environment. Details for scoring have become so complicated that the regional BOCES is sending videos on how to prepare the materials for shipment and delivery to the scoring site. • Clarkstown SD, Congers Elementary School – Some students cried, pulled out hair, had to leave testing setting to bathroom to calm down or walk in the hall. • Clarkstown SD, New City Elementary School – The readability of the grade 3 assessment was more challenging than that of the grade 4 assessment. For students with disabilities, some started the tests and then stopped and refused to continue, some finished in 8 minutes, some filled-in the same answer for the bubble sheet. The assessments did not draw on the use of the NYS modules for teaching, students could not have been prepared for this test even by following the modules. • Clymer SD – There seems to be great concern regarding the difficulty of these tests amongst teachers and students which will result in a higher opt-out percentage in the future. • Westfield Academy, Westfield Middle School – One of the questions raised by teachers last year due to concerns regarding multiple answers was never corrected. Some of the reading passages were repeated from last year. • Shenendehowa SD, Karagon Elementary – The test was very difficult for students with disabilities. Teachers commented that strong students did not have enough time to finish the test. In grade 3, students had to flip back and forth between passages to answer questions – difficult for 8 year old students. • Kingston City SD – The profile of students who opted out were the highest performers – those expected 3 or 4. • Northeastern Clinton Central Middle School – Many of our best students ran out of time. • West Babylon SD – The test was particularly challenging for ELL students who were agitated and upset about the difficulty of the exam. Students with IEPs and 504 accommodations had difficulty finishing even with extended time. • Cuba Rushford SD, Cuba Rushford Elementary – Text was too difficult and not age appropriate. Reading passages are too long. Not enough time to complete, even for most capable students. Questions are too long. Answers to multiple choice questions have more than one reasonable answer—even teachers had difficulty determining the most reasonable answer. The text is not engaging for students. • North Collins SD, North Collins Elementary School – Numerous 3rd graders ran out of time to finish booklet 1. Concerns that there was not enough time for students to “close read” as is stressed and taught in CCLS modules. Over 20% of grade 5 students refused the assessment. • Pine Valley SD, Pine Valley Elementary School – 70-90 minutes is too long for elementary students to sit and focus on the same task. Students with time extensions had to sit and focus for even longer. Students were “wiped out” after the third day of the test. • Carthage SD – Some students did not has enough time to finish the test. • Ausable Valley SD, Ausable Forks Elementary – The test was much fairer than last year, although the readability of many of the passages was well above grade level. Most students finished the test this year, which is a huge improvement over last year. • Tully SD, Tully Elementary School and Jr-Sr High School – Some students did not have enough time to finish the test, and some students finished at the very last second. • Riverhead SD, Pulaski Street School – Many of the questions and passages appeared to be the same as last year. Many students verbalized to teachers that they were not trying on the assessment because their parents told them that it has nothing to do with them and only affects the school. Too many students did not try when they saw their peers not taking the test. • Lyons School District, Middle School – All students who opted out were accelerated students. The attention placed on these tests by the media may contribute to lower student scores – some students barely attempted to answer questions and some drew pictures. The seriousness typically associated with such tests in the past was significantly reduced this year. • Minerva SD – It is what it is – way too overwhelming for our youngest, our most emotionally fragile and a portion of our special needs students. • Island Park UFSD, Lincoln Orens Middle School – The estimated time on-task by SED was completely incorrect. Students were observed using all of the allotted time, 90 minutes. Most students worked all the way through to the final seconds, others did not finish their essays on day 3 or rushed at the very end to finish. • Lake George SD, Lake George Jr-Sr High School – Parents are misinformed about these tests. • Saranac SD, Saranac Middle School – Students and parents have concerns about what opting out means for them with respect to Academic Intervention Services. • Spencerport SD – The passages were mostly fair, but numerous questions had more than one answer – adults argued about what the correct answer was. The principal’s advisory council felt that “The questions were not fair and students ran out of time again.” The last question on the day-1 grade 7 test had full paragraph summaries for students to choose from. Many students chose to write essays to the state about unfair tests instead of answering questions. • Granville SD – The time allotted for the test was too short. If students applied the skills they learned through the common core, they would not be able to finish. Students with disabilities just gave up after the first question. • West Canada SD, West Canada Jr-Sr High School – Some students demonstrated indifference to the test – heads down, bubbling-in at random, not doing the writing, etc. There is serious question regarding the legitimacy of test results. • Downsville SD – Testing ran smoothly. • Victor SD, Victor Primary School – Days 1 and 2, the students were focused and strategic, a number of students were not able to complete the test and some finished in a rush. The anticipated completion times included in engageNY are unrealistic. Day 3, texts were extremely challenging. Students cried, asked repeatedly about what questions are asking – top readers had no idea as to what was being asked. Very capable students became fatigued and discontinued putting forth their best effort. One child pulled all his eyelashes out. • Liverpool SD – Reading passages appeared to be at a more appropriate level, though some passages were boring and did not engage students. Questions and passages did not match in terms of level. Some students were fine, others were anxious and physically sick, others crying, sleeping, or angry. • North Collins SD, North Collins Jr-Sr High School – Many students demonstrated an “I don’t really care about this” approach to the test. • Kinderhook SD – Day 1, reading passages were lengthy, with text complexity beyond students’ reading levels and arcane words. Students complained that multiple choice items seemed to have several plausible answers. Day 2, reading passages seemed irrelevant to the students’ lives and the written response question seemed vague and hard to understand how to answer. • Plattsburgh SD, Oak Street Elementary School – Reasons why parents opted out: Parents are concerned about InBloom. Parents feel their children have not had 3-4 solid years of foundation teaching/learning using common core. Parents do not feel the tests are aligned with common core. Parents do not understand why their child does well in school and scores at level 1 on the test. Parents are concerned that item analysis does not go out to schools until 6 months after the test. • Scotia-Glenville SD – Two students wet their pants because they did not want to get up because they were afraid they would not finish their test. • Riverhead SD, Riverhead Middle School – During the course of test administration students lost focus, stamina and the desire to succeed. • Bolivar-Richburg SD – Two students started the test and then just sat. Several students did not have enough time to finish. • Roxbury SD – An excellent grade 3 teacher is requesting reassignment to a non-tested grade (K- 2). • Arlington SD, Noxon Road Elementary School – Both students and teachers are very disheartened. They feel that they did not measure-up to expectations despite their hard work. • Cheektowaga-Sloan UFSD, Woodrow Wilson Elementary School – The difficulty of the reading passages far exceeded grade level, and vocabulary was very advanced. Many questions were based on text structure, and not on the passage itself. Many students did not have time to finish due to the length of the test. • Elmira CSD – Attendance was better than usual during the assessment dates. Even students who are strong readers had difficulty completing the assessments – if they finished at all – and this was at every grade level. • Richfield Springs SD – Many students in grades 3 and 4 did not complete the test. Compared to last year, one test item was removed, but the allotted time was shortened – therefore there remains insufficient time to complete the test. We have changed the way we teach at RSCS and these tests will not show the real growth we are making with our students. • Camden SD, North Bay Elementary – The majority of students who opted out were stronger students with involved parents. • Altmar-Parish-Williamstown SD, Altmar-Parish-Williamstown Jr-Sr High School – Of the grade 8 students who opted out, 8 of the 10 were honors students for ELA and social studies, and are taking either Math 8 Honors or Algebra 1. Many students who took the test appeared apathetic – they were not trying. Several papers had drawings and sketches rather than essays. Some students still ran out of time for Books 1 and 2, but not as many as last year. • Shenendehowa SD, Skano Elementary – Each day, for each grade level, there were students who did not finish within the allotted time. All else was great. • Bainbridge-Guilford SD, Greenlawn Elementary School – A bigger impact than opting out is the emotional toll that the testing played this year. Whether it’s from media hype, Facebook, and parents talking about opting out, students were very anxious this year. We had four students “meltdown” during the test, and an additional four students get so sick that they could not finish. • Rochester CSD – Many of the students who opted out are extremely capable students. • Johnson City SD, Johnson City Middle School – “Students were not able to finish the test across ALL grade levels.” Students had many texts to read and it was challenging for them to go back into the test and complete their essays in a timely manner. • Johnson City SD, Johnson City Intermediate School – “Students were not able to complete the test across ALL grade levels.” The Hispanic student subpopulation had a 91% participation rate. • Washingtonville SD, Washingtonville Middle School – Parents had various reasons for opting out (some based on misinformation): some did not want their child to test into academic intervention services (AIS), some did not want the scores to count toward teacher evaluations, some wanted to have their child stop complaining about too much testing, and some wanted to make a political statement. • Kendall SD – The time provided to take the exam is not sufficient for the majority of students. Teachers are working to enhance students’ critical thinking skills, but students are not provided the time to use their knowledge to demonstrate their competency – especially for the range of learners taking the test. • Vestal SD – Many families who opted out expressed that they did not see the relevance of the test to their child’s education. In many cases, parents gave students the option to opt out. • Taconic Hills SD, Taconic Hills Elementary School – Questions requiring written responses were particularly difficult, especially for the special education population. • East Bloomfield SD, Bloomfield Elementary School – For grades 4 and 5, teachers said that the test was challenging but fair. For grade 3, teachers said that the reading passages were written at a very high level, questions had difficult vocabulary, several multiple choice answers appeared to be correct to adults. Many students did not have enough time to complete the test. Teachers felt the test was developmentally inappropriate. 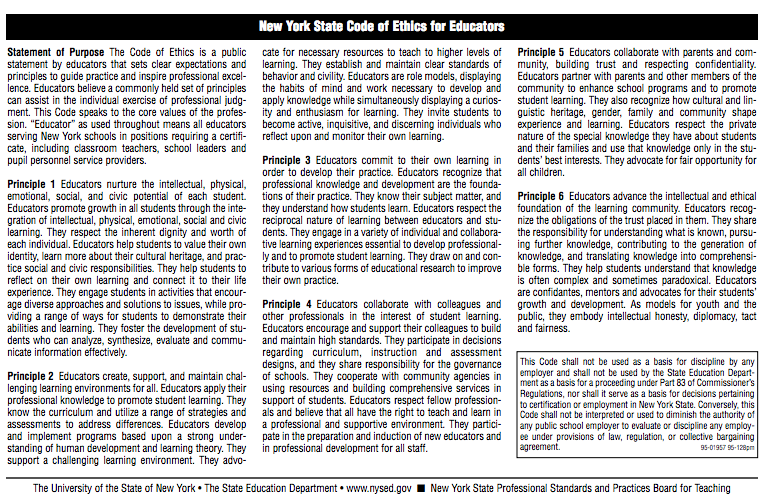 < Previous What Is a Teacher’s Ethical Responsibiity? Next > Rock on Teachers!